Sofft a new contemporary range of art & craft tools form Premium Art Brands Ltd.
A range of unique tools and accessories have been developed under the "Sofft" brand to enhance the creative possibilites of the PanPastel range for the artist and crafter. 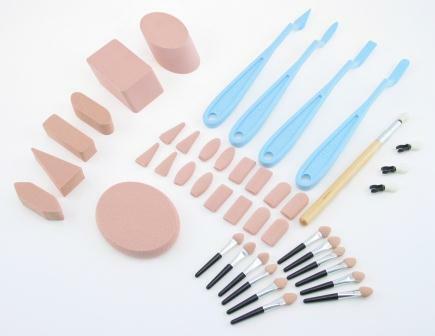 These unique sponge-based tools are made from a specially formulated micropore sponge, so that artists can use them with water-based media for creating a variety of exciting new techniques and effects. Sofft® Tools are versatile, inexpensive, easy to clean and can be re-used multiple times. Use with a variety of painting and drawing mediums for applying, painting, blending and manipulating colour. Sofft Art Sponges are made with semi-absorbent micro pore sponge material. Each sponge has a unique shape and size, designed specifically for artists and crafters. Pack contains 2 angle slice flat sponges. Sofft Art Sponges are made with semi-absorbent micro pore sponge material. Each sponge has a unique shape and size, designed specifically for artists and crafters. Pack contains 2 angle slice round sponges. Applicators are designed to allow a quick application of colour, blending colours together, softening hard edges and applying colour in hard to reach areas. Pack includes 1 applicator handle and 4 replaceable heads. Sofft Art Sponges are made with semi-absorbent micro pore sponge material. Each sponge has a unique shape and size, designed specifically for artists and crafters. Pack contains 1 large oval sponge. Applicators are designed to allow a quick application of colour, blending colours together, softening hard edges and applying colour in hard to reach areas. Pack contains 12 mini applicators. Pack of 8 replaceable heads for use with applicator handle.